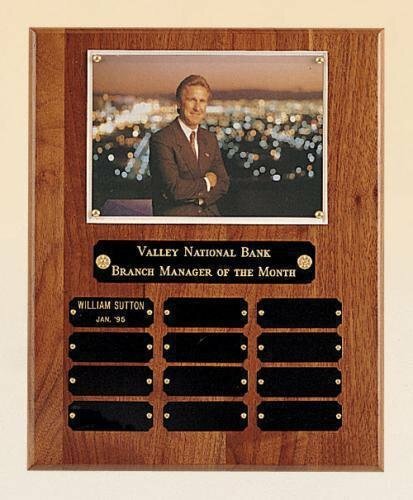 American walnut perpetual plaque with clear acrylic protective cover that holds your 5" x 7" photo. Laser engraved metal engraving plates. Plaques are individually boxed. 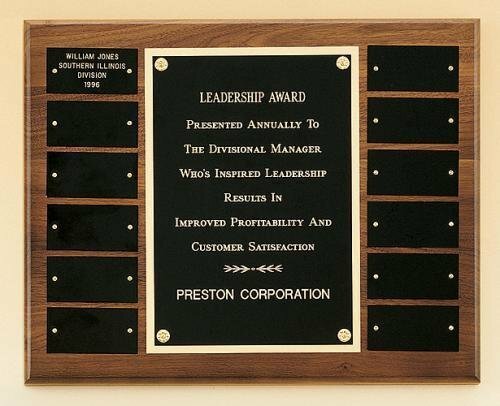 American walnut perpetual plaque. Small black metal plates 1 1/2" x 3" in size. Laser engraved. Plaque is individually boxed. 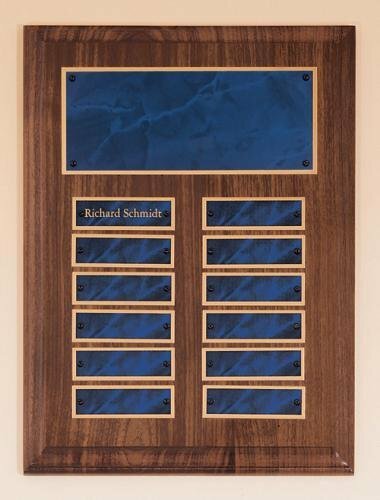 American walnut perpetual plaque with laser engraved sapphire (blue) marble plates. Small plates are 7/8" x 2-3/4." 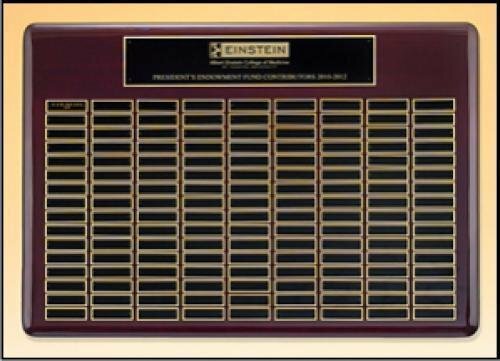 Plaque is individually boxed. 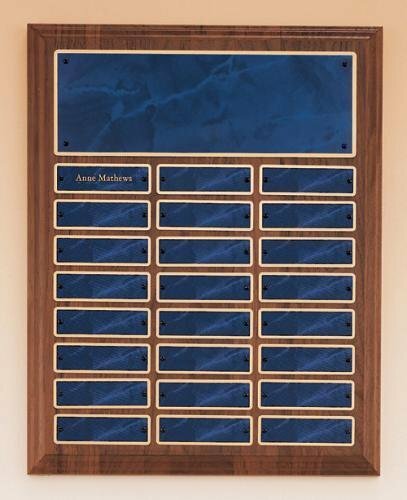 American walnut perpetual plaque with laser engraved sapphire (blue) marbled metal plates. Small plates are 7/8" x 2-3/4." Plaques are individually boxed. Hand rubbed Cherry finished wood perpetual plaque. Engraved black metal plates. Small plates are 7/8" x 2-3/4." Individually boxed. Rosewood piano finished wood perpetual plaque. Over six layers of lacquer are hand applied and polished to create the glossy finish on this plaque. 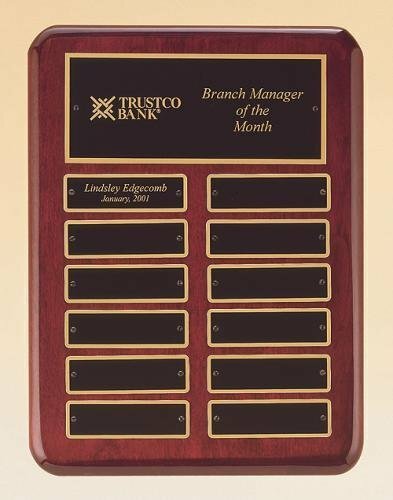 Laser engraved plates. Individually boxed. Small plates are 1" x 3-1/4". 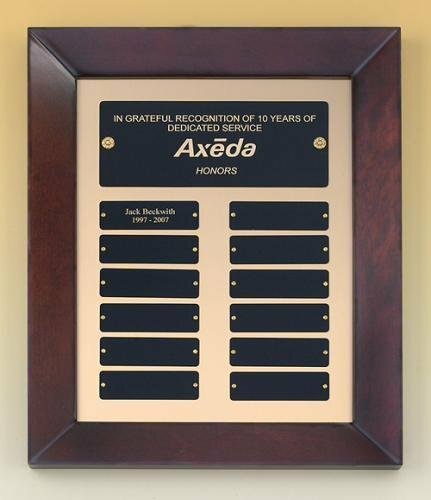 This perpetual plaque is a hand rubbed cherry-finished frame with a brushed goldtone metal backer. Small plates are 1" x 3-1/4". Plaques are individually boxed. 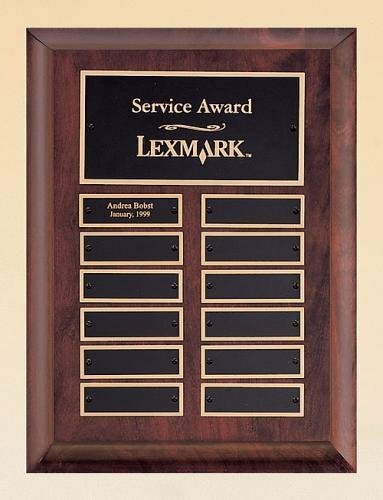 High Gloss Rosewood Piano-Finish wood perpetual plaque. Laser engraved metal plates. Individually boxed. Individual plates are 7/8" x 2-3/4".